Hi Everyone Monday is here again, I can't believe the week has just sailed by. I haven't been able to do much in the way of craft work this week as my craft room has been out of bounds whilst the floor was being painted. I did finish the rag rug I was making last week. It has now been backed with hessian and I think it looks great on my newly painted craft room floor. It's not very big but it is large enough for me to sit on if I need to get down on the floor to work on anything. I like to have lots of space so it's nice to have an easy clean floor that I can use if necessary. I've now been organising my craft room and trying to find a place for everything. I've added some photo's, sorry they are not great but will give you an idea of what I'm doing. I will be making curtains for the cupboards to keep the dust out and to make it look tidy. Josie came in to have a look around once the floor was dry. I was busy trying to take some photo's and just caught her leaving the room. She isn't usually allowed in the craft room so she wanted to have a good nose around before being asked to leave. I will be decorating these shelves as soon as I feel up to it. 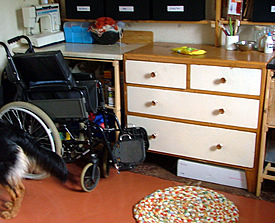 Clearing the room and painting the floor caused a fibro flare so I will have to take it easy for a few days. 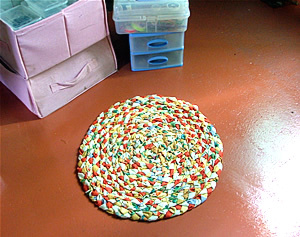 I will be putting the rag rug instructions on my website as soon as I'm able to concentrate for long enough. Click on this Handmade Monday link to see what Wendy and lots of other very talented crafters are up to this week. I'm off there now to see what everyone else is up to. That shiny new floor puts my studio floor to shame! It's painted too, but has had lots of unintentional splashes of paint since then as well. The rug looks fab and it all looks very well organised. It looks a great place to work, lots of shelves and drawers to fill. The colours in your rug looks lovely on the painted floor. Have you put anti slip pads on the back, I worry about rugs on painted floors.... O Hark at me, I sound like a mother hen. Take it easy and put your feet up. 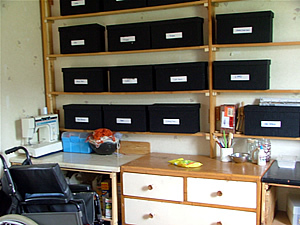 Ooo how lovely to have a craft room, it looks great and well organised. Rug looks lovely. 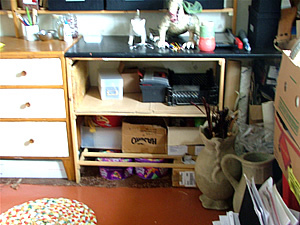 Well done on tidying up your craft room - I'm always 'starting' on mind, but never seem to quite finish it! I just love rag rugs!! I remember learning how to make them at school but have forgotten how now! Very jealous that you have a dedicated craft room too!! That looks great. I love that little rag rug, what a great job you did! Everything looks neat and tidy. What a fantastic space, and so tidy too. The rug is ace, have always wanted to have a go at making one. The rug loooks lovely, and I am so jealous you have such a lovely space to work in!